In the world of high school football, the time must always come for a player to hang up his jersey and retire to the next chapter of life. For Escambia Academy senior Patrick McGhee, that time is near. McGhee has had an outstanding season and career as a Cougar. The running back set an unofficial school record this season with 38 touchdowns and 2,256 rushing yards, and he averaged 11.5 yards carrying. McGhee had an impressive 16 runs that stretched over 60 yards. McGhee had the opportunity to be a part of several state championship games and helped lead the Cougars to the 2017 state championship. He also won the All-Saban award in 2016 and 2017 during the Nick Saban Camp, has been chosen as a member of the 2018 Alabama Sports Writer Association All-State team, played in the AISA All-Star game and won MVP honors in the National Athletic Association of Private Schools (NAAPS) All-American football game earlier this month in Gatlinburg, Tenn.
McGhee has been a member of the Cougar family since his ninth-grade year when he made the transition to Escambia Academy. “This school is more like a family than anything else,” he said. “I have had overwhelming support from the staff and students. I am proud to be a member of this family and team and I want to represent the school in the right way. The game of football forces players to develop confidence and character and McGhee has had a tremendous opportunity to develop those traits while playing for the Cougars. McGhee has been looking at several colleges to take the next step in his football and academic career. 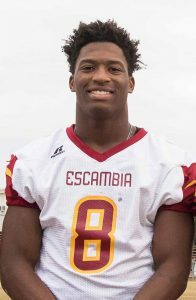 Those among his list of prospective colleges include the University of South Alabama, Alcorn State University, Jacksonville State and others.